Smart Sponge Invention Wipes Up a Deal on Shark Tank! Aaron Krause came into Shark Tank looking for $100,000 for 10% equity in his company, Scrub Daddy, a smiley face shaped cleaning utensil. The product acts as both a sponge when warm and scrubbing tool when cold to clean tough surfaces. Krause, a Philadelphia-based inventor, said his product has already appeared on QVC and has generated $100,000 in four months. His plan for the investment is to set up all of the manufacturing for the product. Daymond John, creator of the Fubu brand, and Lori Greiner from QVC shopping channel expressed animosity toward each other as they both offered deals. 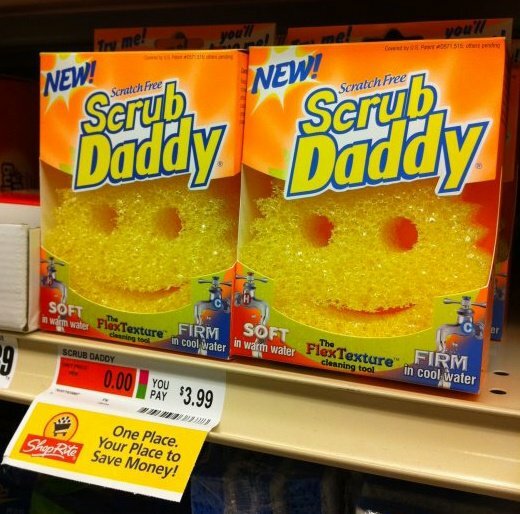 Investor Kevin O’Leary also offered a zero percent equity deal, but in exchange made a royalty offer on the Scrub Daddy sponges. In the end, Greiner offered $200,000 for a 20% stake in Scrub Daddy. Her eyes were bright with thoughts of what she is going to be able to do with the sponge on QVC and in retail stores. Great ideas can go far especially on Shark Tank. If you or anyone you know needs help with their invention or idea, please contact us at New Product Consulting. This entry was posted in New Products, Opportunities and tagged cleaning utensil with heat, daymond and lori, fight on shark tank, help with invention, help with licensing, help with my invention, help with patent, how to get an invention made, invention, invention consulting, invention help, invention tips, license invention, new invention, new inventor, new product, new product consulting, patent, represent invention, scrub daddy, Sell invention, sell my invention, sell my invention on tv, shark fight, sponge hot and cold, sponge on shark tank, steps for inventors. Bookmark the permalink. 1 Response to Smart Sponge Invention Wipes Up a Deal on Shark Tank!